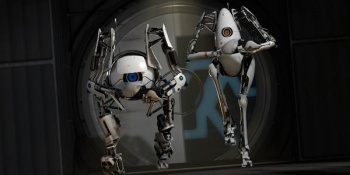 Valve says that Portal 2 for the PlayStation 3 will not feature Move support, no matter what you may have heard. Recently, a tidbit of news has been going around that says Valve plans to reward PlayStation 3 owners of Portal 2 with full-fledged PlayStation Move support. Sadly, the news is a case of the truth getting lost in translation. Eurogamer reported that Valve's Chet Faliszek said Portal 2 for PS3 would have PlayStation Move support on the German PlayStation Blog. It was described as "compensation" for PS3 players that never got to play Left 4 Dead. A supposed translation of Faliszek's comments reads: "As a small compensation we have PS3-exclusive cloud saving, a free code for PC and complete PlayStation Move support. Another comment says: "Move is also a completely new experience for us, thus the system isn't fully integrated yet." Unfortunately, Valve sent out a statement today that denies Move support in Portal 2. It reads: "Unfortunately [Faliszek's] quote was 'lost in translation' -- Portal 2 does not include support for Sony's motion controller." The mistranslation was likely an honest mistake, but we wanted to make sure that nobody buys a PlayStation Move controller simply with the desire to use it for Portal 2. However, when it comes to Portal 3, that may be a different matter.